Robert Pattinson and Lily-Rose Depp have joined the cast of David Michod’s Netflixoriginal production “The King,” the Shakespeare-inspired film starring Timothee Chalamet and Joel Edgerton. Shooting starts in Britain on Friday. Australian actor Ben Mendelsohn has also joined the production. Mendelsohn previously featured in Michod’s debut feature, “Animal Kingdom,” in 2010. 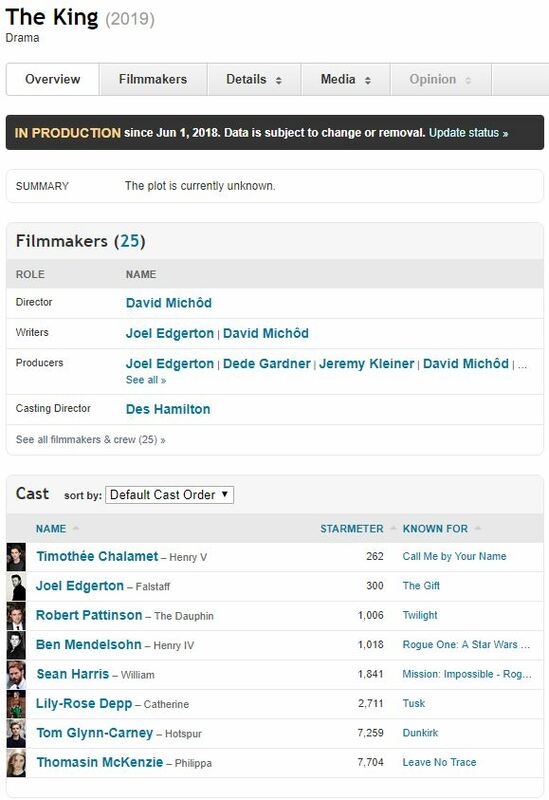 Pattinson and Michod previously worked together on 2014’s “The Rover. Pattinson is set to play the French Dauphin, while Depp will play the French Princess Catherine. Mendelsohn will play Chalamet’s father, King Henry IV. Liz Watts, who worked with the director on both “Animal Kingdom” and “The Rover,” will produce for Australia’s Porchlight Films, alongside Edgerton, Michod and Pitt’s production company, Plan B. “The King”is scheduled to debut on Netflix worldwide in 2019. Robert Pattinson, Sean Harris, Ben Mendelsohn and Lily-Rose Depp have joined Timothee Chalamet and Joel Edgerton in Netflix’s upcoming period drama, The King. David Michod, the director behind Netflix’s War Machine as well as crime drama Animal Kingdom, is helming the production, which begins June 1 in the U.K., and wrote the script with Edgerton. Chalamet is playing Hal, while Edgerton is Falstaff. Pattinson will play The Dauphin, who is a French duke; Mendelsohn will play King Henry IV; Depp will portray Princess Catherine, daughter of the French king, who marries Hal; and Harris will step into the shoes of William. Posted in Sites / Blogs, The King, UncategorizedBookmark the permalink.